In 367 AD, four Roman soldiers in Roman Britain: Leocadius and Vitalis, two pedites [foot-soldiers], Semisallis Paternus and Circitor Justinus, have been out hunting and are shocked to discover one Agricolan fort [Banna] overrun and the soldiers inside slaughtered, the eyeless primus pilus dead and hanging from the palisade. They find another fort [Camboglanna] destroyed, as well as those on the Wall. Horses have been stolen from a fort that had housed a cavalry ala. Paternus is frantic; he can't find his wife and young son, who had lived near Camboglanna. When the soldiers do reach Eboracum, HQ of the VI Legion, Leocadius lies to the praeses [legate] and to Fullofaudes, the Dux Britannorum, about the extent of their repelling the barbarian attacks; in reality they had done nothing and fled. All four are promoted to high level officer rank and from then on called 'heroes of the Wall'. The High Command intends to use them for propaganda and morale-boosting purposes. From then on, the four men are uneasy with any changes in their status; they know they are living under false pretenses. Leo knows he cannot retract his impulsive words and the others go along with him. These raids and killings begin the 'Barbarian Conspiracy'. Several British tribes: Caledonians and Picts from the far north; Scotti and Attacotti from Hibernia; and some Saxons are all led by a man riding a black horse in a silver cavalry parade helmet and face mask to hide his identity: Valentinus, 'Man of Valentia'. Britannia by this time in history has been divided into four administrative districts, of which Valentia is one. There were plenty of red herrings in the novel as to his real identity; sometimes I even wondered if Valentinus had a double. Rumors intensify Valentinus' physical appearance and sightings of the man in many different places abound; positive reputations of the four 'heroes of the Wall' increase exponentially. The novel traces the subsequent lives and fortunes of these four soldiers, how they change because of the original lie--not always for the better. Count [Comes] Rei Militaris Theodosius, along with his son, arrive, with Magnus Maximus and a field army, including cavalry alae. The Roman army searches feverishly for Valentinus, from the Wall to south Britannia, seeking vengeance. This story was action-packed from the very first page. We see how Leo's lie twists at least two of these men inside and overshadows the subsequent lives and deeds of all four men, leading to unintended consequences of their actions. The various skirmishes and final battle with Valentinus were exciting and vividly portrayed. The novel presented us with religious controversy [Nicene and Pelagian Christianity and Mithraism], gladiatorial combat, and the burning of Londinium. I recognized some modern catchphrases and even Shakespearean quotes in the dialogue which have passed into common usage [not back then, of course:)]. Some sardonic, bitter humor added spice to the story. The authors have taken what scanty information we have of that period and put together a creative, imaginative, unputdownable story. The authors wrote plausibly about Fullofaudes' death and the ambush of Nectarides, Count of the Saxon Shore. Historically, anything we know about the death of either is conjecture. I found myself having to read between the lines sometimes; everything was not always transparently spelled out. Somehow, since there were two writers, to me the styles sometimes varied although the story itself was seamless. I wondered, with the dialogue, if it was one particular author who supplied the modernisms or quotes rather than the other. One author was definitely the historian. I felt any subsequent promotions or appointments to higher-level civilian positions of the characters were quite unbelievable, though I did cut some slack for the very first military promotions. Character development was excellent all through the novel and showed us the descent into pure depravity of one character and improvidence of another, who searches for meaning to his life, all through the novel. I liked the author's portrayals of General Magnus Maximus, his mastiff, Bruno, and that of Stephanus the German, leader of one of the cavalry alae. The ending was a cliffhanger, leaving room for a sequel, which I understand has been planned for. I know I will enjoy reading it.Since this review I have eventually read and really enjoyed the other two books in the trilogy. I regretted the lack of any maps, historical notes, glossary of Latin terms and explanation of the late Roman army. Subsequently, the authors have issued a book which takes care of these omissions and adds more information--World of Britannia: Historical Companion to the BRITANNIA Series. I recommend this novel highly. 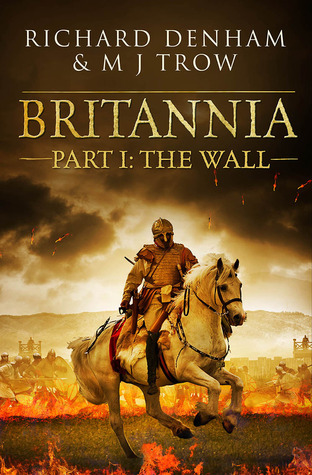 Britannia Part 1: The Wall is a work of fiction set in a historical backdrop of occupied Britain in the Roman era. Hadrian's wall has been built and it is up to the VI Vitrix to defend the wall against the Barbarians from the North.The book opens and introduces us to four leading characters, soldiers of the VI, who are out hunting. Leocadius is just 19, Vitalis 18, they are out with Justinus aged around 30 years and Paternus who is a family man of just a little older. They've been hunting for two days and are returning home when smoke and scavenger birds alert them to trouble. They find the fort of Banna has been attacked and no one is left, Paternus fears for his family. Rushing to the next stronghold along the wall the soldiers finds this one has been savagely attacked as well, and it's not just one, the wall has been lost. They suspect the Picts, Saxons and Attacotti. Heading for the larger Roman town of Eboracum (York) The four soldiers come across an Arcani, a wise man of Britain, a man of the land called Dumno, also a paid Roman informer. They Learn of a mysterious Hero of the Barbarians called Valentinus, who controls these Barbarian armies and wants to rid the land of the Romans.These four soldiers become heroes of the Wall, rumours spread of brave deeds and the Roman leaders use the men to drum up positive response to the attacks from Valentinus. Attacks that pour fear into an Army which once had a fearsome reputation and now looks like it might be defeated. But who is the man behind the silver mask? The biggest fear is the unknown.All over Britain talk of Valentinus spreads as Roman Britain itself moves forward. In Londinium Leocadius and Vitalis both find themselves in positions unthought-of because of their Wall hero status. We see a City with different religions that people follow out of belief and fashion. This book drops you right into Roman life in Britain, with the harshness of living in the wilds of the North, to military life and civilian lifestyles. It's all about survival, unless you are an army man and then it's all about Rome. A good historical book. This was an enjoyable read. The story of four young soldiers on Hadrian's Wall, following their fortunes and adventures. After the wild men of the north unite and destroy the Romans along the Wall and terrorize the south, these men, the only survivors, are acclaimed heroes. It's all based on a lie, but they are caught up in it and swept along by events that follow. As the war continues each one finds a different and undreamed of path to take. Plenty of intrigue and sword play. I would recommend this to any Roman fan or sword fantasy lover. Outstanding!Denham has done his research and produced a novel worthy of the Roman soldiers who are its main characters. This is no common work of fiction, relying on a sensational narrative of bloody battles and lustful orgies. Instead it is filled with well developed characters who are all too human, with all their strengths and weaknesses. Based on the true events of Rome's struggle to retain its rule over Britain as the Empire itself was starting to crack, it engrosses, educates, and entertains! I look forward to reading the next volume in the series and to 're-reading this one and savoring at my leisure. This is the first of a trilogy of novels set in late Roman Britain, spanning the 4th century ‘Barbarian conspiracy’ to the withdrawal of the legions from Britain in the early part of the 5th century. The novel(s) centre around four relatively lowly roman soldiers who, by accident, survive the overrunning of the wall in 367 and find themselves heroes. They subsequently become involved in the various military and political events that follow the barbarian conspiracy. One aspect of the plot which I found unlikely was their rapid rise through the ranks, but I was able to suspend disbelief because the story was such a page turner. I came to love the four main characters, who were all different, although I found Leocadius a bit of a struggle to get to know. It would have helped, I believe, if the reader had been given a bit of background on the characters prior to the events at the beginning, possibly through flashback, to discover where they’d come from. Other reviewers have commented on the manipulation of history with the inclusion of Magnus Maximus in this period, but he was such a compelling character that it felt justified. This is a novel, after all, and not a historical treatise. I particularly liked the involvement of one of the main characters, Paternus, with the Votadini tribe, thus neatly explaining the appearance of a certain Padarn Pesrut (red cloak) in the later Gododdin genealogies. I’m giving this five stars although if there had been the option to give it 4.5 then that's how I would have ranked it since a few things detracted. Some details of the plot I found unlikely (such as Leocadius knifing a fellow soldier in front of witnesses with no consequences). Also, I was found the shifting of point of view, sometimes within the same paragraph, to be slightly distracting. There was no map in the kindle version I read, or a glossary, which would have been useful since I’m not familiar with the structure of the roman army in the 4th century and found the terms such as ‘semisallis’, ‘circitor’ and ‘praeses’ confusing. The author uses some modern expressions in the various characters' speech, but on the whole the dialogue was convincing. It’s a measure of how I enjoyed this book that as soon as I finished it I immediately bought the follow-up novel, Britannia: The Watchmen, to find out what happened next. Good reading.The last time I rated anywhere called the wall was last century and by Pink Floyd. ExcellentWonderful look into the years before Arthur. Very detailed with interesting plot turns. Fell in love with The Wall boys. Obviously well researched and ambitious. However too many characters for me leaves this lacking a narrative central point. There is a massive assumption that a reader knows where all the places are mentioned in the book - I live near the Roman Wall and I knew some..... makes it hard to visualise where things are happening. a fairly entertaining tale of the end of roman occupation in northern Britain. Four central characters become the focus of the historical tale of the 4th century. Richard Denham M.J. Trow - Richard is the co-author of the popular 'Britannia' series with M. J. Trow. These books follow a group of soldiers and their descendants through the madness of a chain of events which will eventually lead to the fall of Roman Britain and the descent into the Dark Ages.